Writing the posts in this devotional series has helped me find out who I am in Christ. I write from my heart. I write about things that I struggle with, knowing that if I struggle, then many of you might too. I have always struggled with identity issues. I have never felt that I was good enough. Through these posts, I have discovered who I am and I hope that you have too. 1. That God sees my heart. He looks past the outside and sees who we truly are on the inside. 2. I have been adopted by God. God loved me enough to adopt me. I am His child. He loves me unconditionally and that will never change. 3. I am redeemed and forgiven. It doesn’t matter what sin I commit, If I approach God with a sincere heart, asking for forgiveness, He is faithful to forgive. Not only does He forgive, He erases the sin and gives us a do over. 4. Nothing will ever separate me from the love of God. 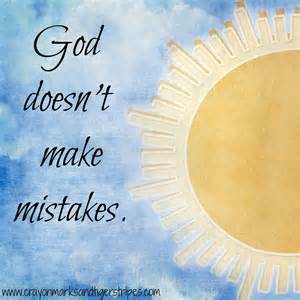 Even when I mess things up, I know that God still loves me. 5. I am a work in progress. Sometimes it seems that I am getting nowhere, but God will complete what He started. 6. 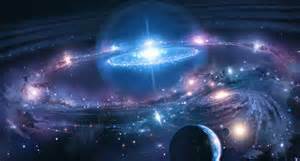 God chose to create me BEFORE He created the universe. He chose to create me, just as I am. 7. He has given me a spirit of courage, not fear. I have nothing to fear, as long as I stay in Him. 8. 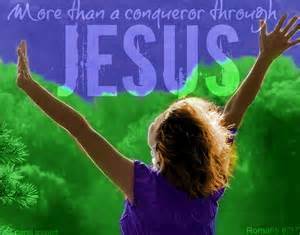 I am more than a conqueror in Christ. With Him as my partner, I can accomplish anything I set my mind to. 9. God is approachable. When I have a problem, I can go to God. His door is always open, day or night. 10. I can do ALL things in Christ. There is nothing that can stop me from doing God’s will. 11. I was made in the likeness of God. In my spirit are all the characteristics of God. I simply have to choose to let those characteristics shine through. I hope this devotional series has encouraged you in your walk with God. I hope that you know how much God loves and treasures you. Never think that you are unworthy of love and respect. You are worthy! You are God’s beloved child! There have been times when I have struggled with this concept. How can we have been made in God’s likeness when we are saturated in sin? How can we possibly be anything like God? God is spirit. He does not have a body like you and I do, so how can we be anything like God? God created us with a spirit, He also created us with the same characteristics that He embodies. God created to love as He loves, to be gentle in our interactions with others, to share ourselves with others, to live with passion and joy, and to love peace. 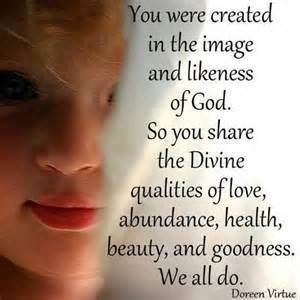 We have all the goodness of God within us. In His goodness, He also gave us the freedom to choose how we want to live. Adam and Eve had the freedom to choose and through their choice, they brought sin into the world. I know there are times when we blow it big time. We will always make mistakes, we will always sin. Don’t let that discourage you. We were made to be like God! We should aspire to be righteous in all our ways and faithful in all we do. We can live our lives in the spirit of God. Don’t beat yourself up when you sin, ask forgiveness and move on. God doesn’t hold on to our sin. I am challenging you to search the Bible and find out who God is. Write down all the characteristics of God that you find and hang the list up where you will see it every day. Use this as affirmation of YOUR true character. Never give up aspiring to be like God. This should be our passion in life. When life gets tough and you need some help pursuing God’s likeness, just ask Him to help you. He is here with us. He will never leave us nor forsake us (Deuteronomy 31:6, Hebrews 13:5). God’s character lives within us. There is no one else I’d rather be like. How about you? I can give a long list of why something won’t work, but rarely will I list reasons why something could work. Can you relate? My 14 year old, Talon loves this verse. Any time, he hears someone say why something won’t work out, he quotes this scripture. It is a great reminder. On our own, we can do nothing. With Jesus as our partner, we can do all things. Is your dream to be a medical missionary? What’s stopping you? Is your dream to become an auto mechanic? What do you need to do to make it work? Is your dream to make a living as a writer? Then start writing. Instead of listing why something WON’T work, make a list of why something WILL work. Make a list of the steps that you will need to take to make your dream a reality. What step can you take right now to push you in that direction? Take 15 minutes every day to take some action to propel you forward in achieving your dreams. 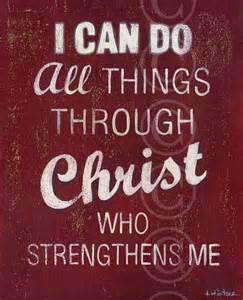 Repeat to yourself: I can do ALL things through Christ who gives me strength! Negative self-talk is a tactic of Satan to get us to doubt ourselves and God. When we doubt, we don’t move forward in God’s will. When we live our lives in doubt, we will never get anywhere. Don’t allow yourself to live like this. Don’t let Satan win. 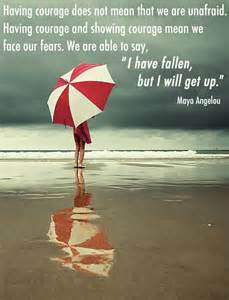 Have faith! There are people in the world that feel that they are to “bad” to become a christian. They feel that God would never listen to them because of the sins they have committed. Friend, if this is how you feel, let me tell you something about God. According to Ephesians 3:12, we may approach God with freedom and confidence. The stipulation is, that we need to be IN Jesus and have faith in Jesus. There are many times in scripture, when God will make promises, but He expects certain things from us in return. This is one of those times. Remember, that God gave us His Son Jesus as a free gift. It is up to us to accept that gift. If we choose to accept Jesus into our lives and we have faith in Him, then God’s promise to us, is that we may approach His throne with freedom and confidence. God does not say, “if you are without sin you can talk to me” or “when you become perfect you may approach me.” Our Abba Father wouldn’t place such unrealistic expectations on us. He only wants us to accept the free gift of His Son. His door is always open to us. Day or night. Happy or angry. He is here to listen to us and help us as He sees fit. We will NEVER be perfect. We will NEVER be without sin. God is waiting for you. His door is open. 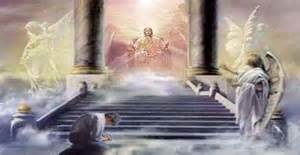 Don’t be afraid to approach the throne of God. He loves you and always will. Don’t let this day end without letting God know what’s going on in your life. There is never a bad time to tell God how you feel. Let me start by saying that there are wise Christians, who really are looking out for our best interests and simply want us to make sure that we are doing God’s will. That said, there are many more people who want to poo poo on our dreams and passions simply because they are mean spirited. In this day and age, we are bombarded with criticism and reasons why we can’t do something. We are surrounded by negative “thinkers” and pessimistic people who like to rain on our parade with their negative words. If you have a God-given dream or passion, then step out in faith and make that dream a reality. If it is truly God’s will, then God will make it happen. Look at Noah. I bet his neighbors called him crazy and thought he needed to be locked up in a padded cell, but Noah listened to God, built the ark and the rest is history. Noah didn’t care what the rest of the world thought. God’s opinion was the only one that mattered. Noah stepped out in faith and God blessed him abundantly. Don’t listen to the naysayers. If you have a God-given dream, then trust God and build your ark. You are more than a conqueror in Christ.